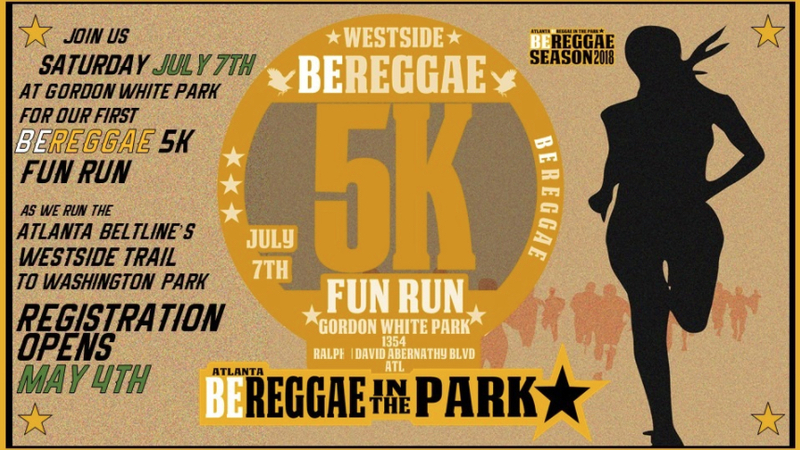 Starting and finishing at Gordon C. White in the Historic West End Neighborhood of Southwest Atlanta, the BE REGGAE 5K Fun Run is a fun and fitness way to celebrate during the BE REGGAE season. The Fun Run is one of the many events leading up to the 5th Annual Atlanta's BE REGGAE in the PARK on August 11, 2018 at Perkerson Park. Atlanta’s Reggae in the Park is a celebration of Afro-Caribbean Reggae culture.that promotes unity and togetherness under the banner of Reggae music and culture. The 3.1-mile course along the Atlanta Beltline Westside Trail, provides a scenic, festive route through westside neighborhoods to Washington Park and with a return route back to Gordon C. White Park. It is the open to all. The race day activities include warm-up, inspiration, booths presented by sponsors and various organizations and of course REGGAE MUSIC!! The BE REGGAE 5K Fun Run is a great recovery activity for recent Peachtree Road Race participants and a great way to start off your 2nd half of the year!